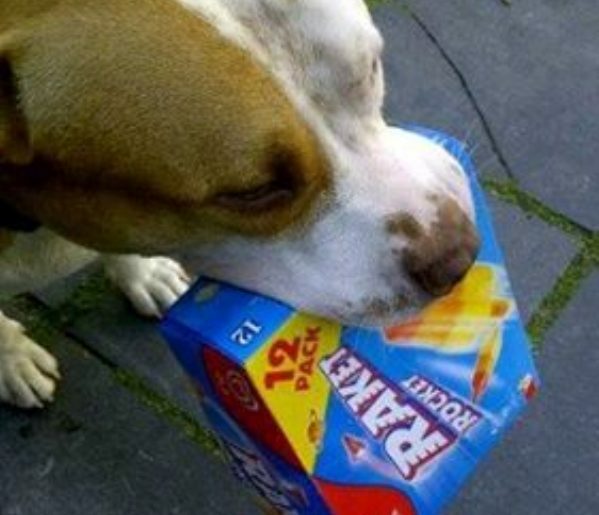 Troy, a Pit Bull who lives in Amsterdam, “pawed” it forward to his rescuers. He hand — er, mouth — delivered a gift to the police officers who saved his life. While walking through Rietlandpark with his owner last month, a bee stung Troy’s neck. Troy went into shock and couldn’t walk. When his owner yelled for help, he was fortunately heard by officers at the Piet Heinkade police station across the street from the park. The officers rushed Troy and his owner to a veterinarian. Because they got him there so quickly, Troy was able to make a complete recovery. The veterinarian said Troy would not have been so lucky if it had taken longer for him to get treatment for the sting. Today Troy showed his appreciation to these heroes — with a box of popsicles. “Troy gives his saviors ice cream as a thank you!” Politie Amsterdam posted on their Facebook page, along with a photo of the happy dog making his delivery. If your own dog is ever stung by a bee, here are tips for what to do.